New Horizons received the “Provider of the Year Award” at the 2019 ARC of Oakland County Dove Awards. This award is presented to an Oakland County based provider, who maintains a consistent, positive, and nourishing community-based setting for persons with intellectual and/or developmental disabilities. 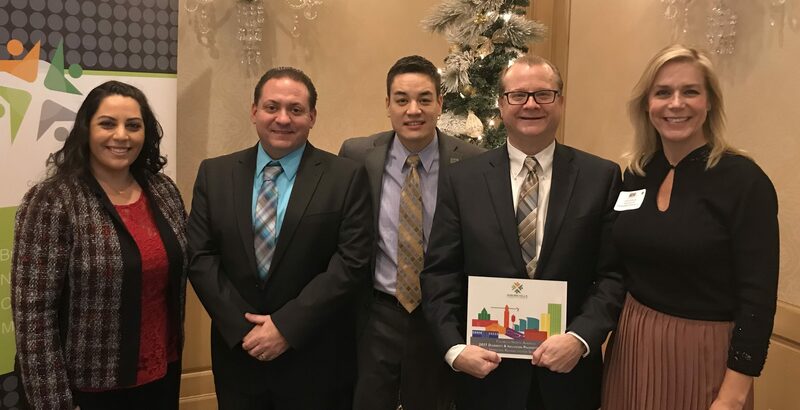 New Horizons received the “Human Resources Vanguard Award” at the 2018 Auburn Hills Chamber of Commerce Silver & Gold Awards. This award is presented to a company that takes on human resource challenge in a creative and innovative way given the increased competition for talent, the complex regulatory environment, and our litigious society. New Horizons received the “Diversity & Pacesetter” Award at the 2017 Auburn Hills Chamber of Commerce Silver & Gold Awards. This award is presented to a local company who promotes and facilitates a culture of diversity and inclusion in the categories of work environment, career development, training, networking and mentoring. The ARC of Oakland County presented New Horizons’ President/CEO Stan A. Gramke, with the 2017 Hall of Fame Award. This award recognizes those in the rehabilitation field who are considered icons for the cause to provide employment opportunities for people with disabilities. New Horizons was selected for the 2017 Nonprofit achievement award by the Rochester Regional Chamber of Commerce. New Horizons has been working with the Rochester Downtown Development Authority for 26 years, providing employment for individuals with disabilities. A special tribute was presented to New Horizons by the United States of America House of Representatives for our achievements. New Horizons received the highest level of accreditation with a 3 year CARF accreditation. CARF is the Commission on Accreditation of Rehabilitation Facilities establishing national standards of quality care for rehabilitation organizations serving people with disabilities. Source America presented New Horizons’ President/CEO Stan A. Gramke, with the 2016 Management Excellence Award. This award recognizes an AbilityOne Community Rehabilitation Program (CPR) who has demonstrated excellence in leadership, by significantly enhancing the employment opportunities for people with significant disabilities. New Horizons received the “Borg Warner Passion for Excellence” Award at the 2016 Auburn Hills Chamber of Commerce Silver & Gold Awards. This award is given to a company with a proven commitment for excellence. Source America presented New Horizons’ person served Beth Downey, with the William M. Usdane Regional Award. This award recognizes an AbilityOne Program employee with a significant disability who has exhibited outstanding achievement and exceptional character. The ARC of Oakland County 2015 Dove Awards presented New Horizon’s Board Member and original founder Betty Fisher, with the Distinguished Service Award. This award honors those that have made a significant contribution to enhance the quality of life for persons with intellectual and/or developmental disabilities. A Certificate of Recognition from the State of Michigan was presented to New Horizons Rehabilitation Services for its 50 years of service in helping people with disabilities succeed. 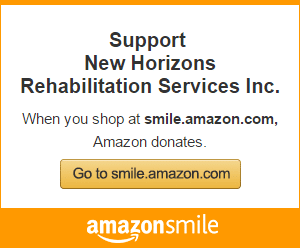 Ronald N. Storing, Vice President for New Horizons Rehabilitation Services, received the 2013 Golden Dove Award. Storing was honored as a retiring administrator in Oakland County who has shown many years of service and long term commitment and dedication to the education of children and young adults with intellectual and/or developmental disabilities. Ronald N. Storing, Vice President for New Horizons Rehabilitation Services, received the 2013 TINA award presented by MARO association at the 2013 re:con convention. This award honors individuals who are visionaries, distinguished agents of change, and consistently impacted service systems and public policy. The Arc of Oakland County presented New Horizon’s Board Member and Past Chairperson, J. Douglas Otlewski, with the Janet & Paul MacCormack Lifetime Achievement Award at the 2012 Dove Award Ceremony. This award honors his many years of dedication to serving and advocating for people with disabilities. New Horizons was selected for the 2012 Best of Auburn Hills Award in the Employment Agencies category by the U.S. Commerce Association (USCA). The USCA “Best of Local Business” Award Program recognizes outstanding local businesses throughout the country that have achieved exceptional marketing success. The Arc of Oakland County 2010 Dove Award presented New Horizon’s CEO/President Stan A. Gramke with the Janet & Paul MacCormack Lifetime Achievement Award. This award reflects his many years of successful management and service in the field of human services. The New Horizons Soft Skills Training Curriculum Program was selected as a 2007 Mutual of America Community Partnership National Award Merit Finalist. The Selection Committee was impressed by the program’s impact on the lives of the targeted population and the impressive results of this dynamic collaboration since its inception in 2005. New Horizons was chosen as a “Diversity Champion” for being a nonprofit organization that creates or promotes special programming, education or other initiatives that focus on diversity. Corp! Magazine is a long-time supporter of diversity and multiculturalism in business. Ronald Storing, Vice-President of New Horizons, was the recipient of the 2007 Michigan Rehabilitation Conference Excellence Award that is given to an individual who has demonstrated excellence in leadership, effectiveness, creativity, advocacy, and commitment on behalf of persons with disabilities and other barriers to employment. NISH presents this national award annually to one community rehabilitation agency that uses the AbilityOne Program contracts to fulfill and advance its mission in support of people with severe disabilities. The AbilityOne Program creates jobs and training opportunities for people who are blind or have other severe disabilities, empowering them to achieve greater independence and lead more productive lives. NISH (National Industries for the Severely Handicapped) presented New Horizon’s CEO/President, Stan A. Gramke, with the Management Excellence Award from the National Council of Work Centers. This prestigious award is a reflection of his many years of successful management and dedicated service in the field of human services. New Horizons was recognized by Automation Alley as an organization that has shown unsurpassed dedication to the growth of Southeast Michigan with proven programs directly benefiting Michigan businesses and/or future employees. Automation Alley encompasses more than 650 businesses, educational institutions and government entities driving the growth and image of Southeast Michigan’s technology economy.